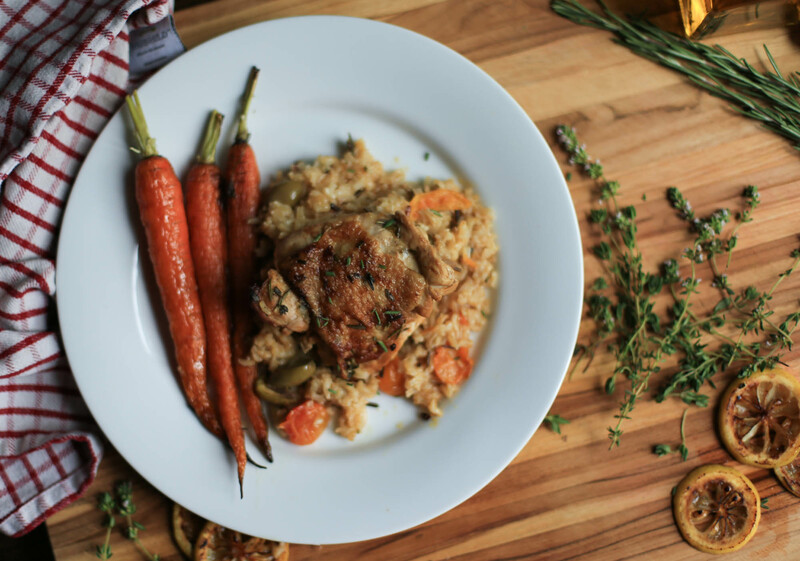 Healthy Mediterranean Chicken & Rice, Plus a Giveaway! Chicken and rice are quite the dynamic duo, and there are so many different ways to make the combo. 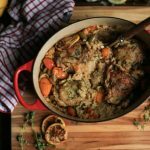 I have landed on a recipe that I think is out-of-this-world delicious, all made in one pot for easy weeknight dinners. Fresh rosemary, thyme, lemon, and garlic give a lot of flavor to the simple, juicy roasted chicken. I’ve also added tomatoes and olives, resulting in some incredibly flavorful rice. Oh man, the rice. I can’t even. On top of all that, it’s The District Table’s first giveaway! Keep reading my friends. Casseroles are a popular thing, for good reason. They’re easy to make, feed a crowd, and easy to clean up. But they don’t require canned cream of something or tons of dairy to taste good. Flipping through my Wisconsin cookbook I was hard-pressed to find a relatively healthy casserole. So I set out to make one for myself. There is no milk or flour necessary with this recipe, so it’s actually dairy free and gluten free, but bursting with the flavors of lemon and olives and fresh herbs. Okay let’s cut to the chase, right? What am I giving away for free?? Two things I hate doing in the kitchen is handling raw chicken and the menial task of prepping fresh herbs. Yet here I am with a chicken and herb recipe. The chicken thing, I usually outsource to my husband. But for the herb thing, I have a secret weapon. 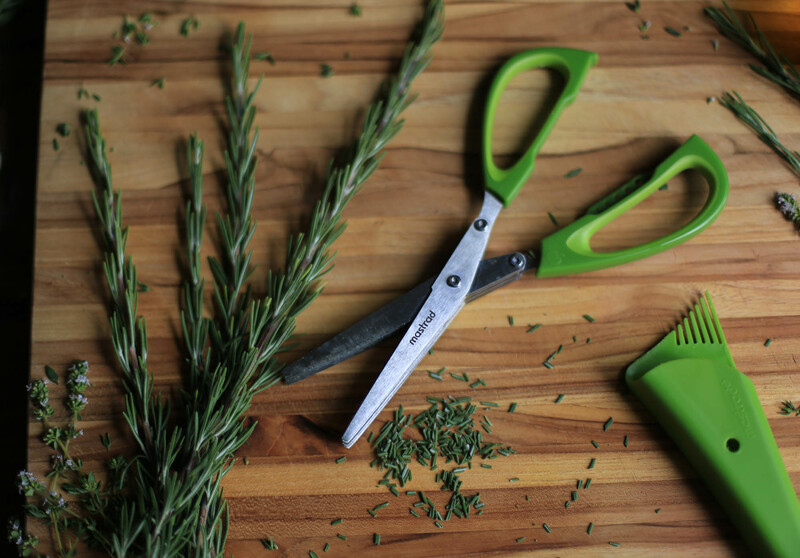 I happen to love my Mastrad herb scissors so much that I want a lucky reader to have a pair as well (read: unsponsored! just because I like you!). The giveaway is now closed. The winner is: Tracy S.! Congrats!! 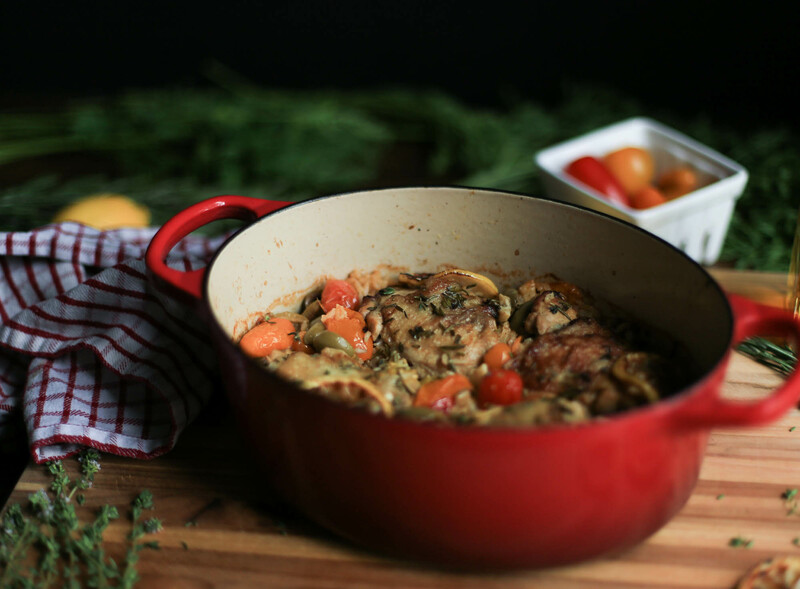 Toss the chicken thighs with olive oil, rosemary, thyme, lemon juice, garlic, salt, and pepper in a shallow dish. Marinate for 2 hours, up to overnight. Preheat the oven to 350 degrees F. In a large, heavy pan, heat 1/2 tbsp olive oil over medium-high heat. Sear the chicken, skin-side down, for 3-4 minutes until browned, and then flip over and repeat with other side (reserve any of the leftover marinade). Remove the chicken to a plate and set aside. Use a paper towel to carefully wipe any blackened bits from the pan. Heat 1 tbsp olive oil over medium-high heat. Add the rice, the wild rice if using, paprika, salt, and pepper and saute for about 1 minute, stirring regularly. Add the chicken broth and reserved marinade to the pan and bring to a simmer. 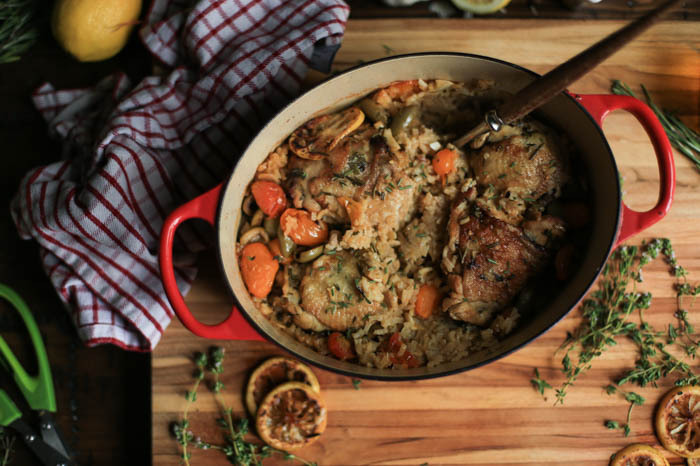 Nestle the chicken thighs among the rice, cover the pan, and transfer to the oven. Bake for 20 minutes, then add the tomatoes and olives. Use a spoon to carefully mix them into the rice. Cover and bake for 10 minutes more, then remove the lid and bake for 10-15 minutes, until the rice is tender and the liquid is absorbed. Let cool for 5 minutes before serving. If you use boneless, skinless thighs or breasts do not brown them as long in the pan. They will not need as much cooking time as bone-in, skin-on thighs. Save on time and roast some veggies for a side dish at the same time that the chicken is baking! 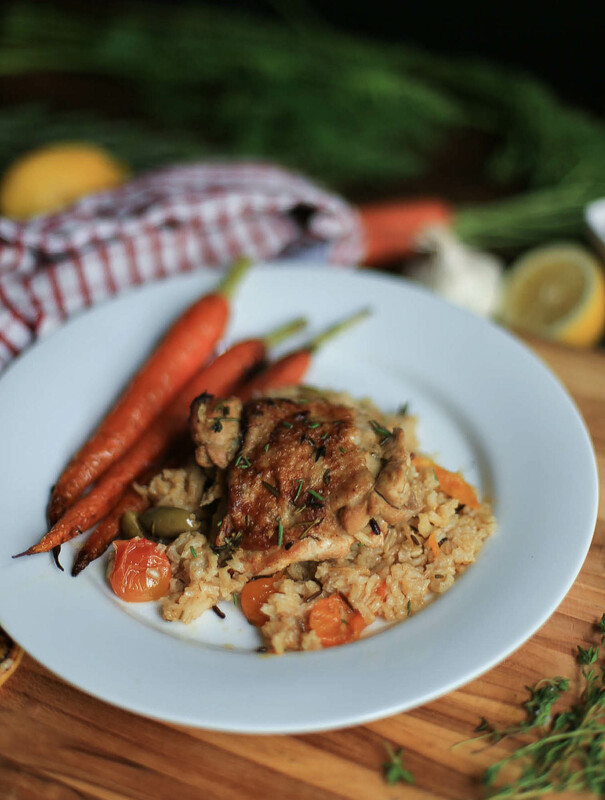 37 comments on Healthy Mediterranean Chicken & Rice, Plus a Giveaway! My favorite weeknight chicken recipe is chicken Parmesan with pasta, the kids love it too! I love to cook up chicken piccata! I love a really good roasted chicken with lemon. Annnnd I spelled my email address wrong….but I bet you can figure out what it’s supposed to be…! My husband BBQ chicken, it is delicious. I like creamy herb chicken over pasta. I love to make garlic chicken on the stove. We fix spicy chicken and it is as I good! We like chicken alfredo or chicken with Bay seasoning with garlic mashed potatoes. My favorite is my chicken dressing casserole. My children always ask for it and it is easy to make. I brine my chicken, baste with butter, season and bake. So tender and delish. My favorite week night chicken recipe is chicken Parmesan! I like no peek chicken. Baked chicken over rice. Lemon chicken cutlets are a favorite around here! I like a good chicken and veggie stir fry! SPICY CHEESY Chicken and Rice! It’s the best! I brine chicken breast’s for a couple of hours then a mix some spices including chili powder and cumin melt some coconut oil with it then coat the chicken and grill it, it comes out very tender. We like chicken and dumplings. I like making chicken stew with a lot of veggies. My favorite weeknight chicken dish is baked chicken thighs that have been marinated in Italian dressing. We love Mexican chicken and chicken fajitas. I love making chicken parm with angel hair pasta! I love chicken piccata over angel hair pasta. I love making homemade chicken and dumplings! My kids enjoy rolling the dough out and helping me with the whole process too which makes it that much better! My favorite is Green Chili Chicken Enchiladas! My favorite is campfire chicken with carrots and potatoes. I love a simple baked chicken with BBQ sauce.